looks over several RVs that were damaged in an early morning fire Tuesday. HESPERIA — An early morning fire caused at least $250,000 in damage to motor homes and buildings at Range RV in Hesperia on Tuesday, officials said. A motor home was destroyed and four others damaged, fire officials said, but there were no injuries. County fire investigators blamed the blaze on a faulty refrigerator inside a motor home parked at the lot awaiting repairs. Firefighters said the blaze broke out at 5:30 a.m. inside a motor home parked at the business in the 11400 block of Mariposa Road, according to Tracey Martinez, a spokeswoman for the San Bernardino County Fire Department. Heat from the fire also caused minor exterior damage to a nearby parts store at the location. Heavy smoke filled the store. Range RV, the Victor Valley's largest RV dealership, was closed at the time of the fire, and no employees were working, said owner Joe Range. 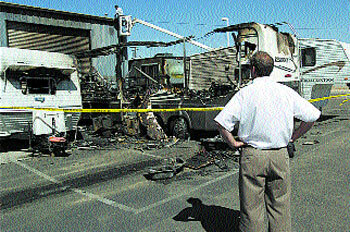 Some of the damaged motor homes belonged to the company. The owners of the other damaged motor homes were promptly notified of the fire, Range said. "My employees feel badly that customers' coaches were damaged," Range said. "We're highly concerned about our customers, and have been working hard on getting the store back in shape for business." Range said his insurance company sent an adjuster and investigator to the scene. Range said he preferred not to discuss the fire's cause until the insurance company and fire investigators had made a determination. Range credited employees at the facility for keeping the business open Tuesday. "They did a great job of getting the place ready for business again and taking care of customers," Range said. Mike Cruz can be reached at mike_cruz@link.freedom.com or 760-951-6276. James Ramage can be reached at james_ramage@link.freedom.com or 760-951-6242.